Achieving proper compaction is a critical step in many landscaping and construction projects, from laying the base for a paver patio to prepping for a poured concrete driveway. We stock a wide range of compaction tools, including a variety of diesel and gas-powered plate compactors. The staff at Sharecost can help ensure you get the right compactor for your project, so you can ensure it stands the test of time. Heavy-duty design. Weighs 1100 lbs. 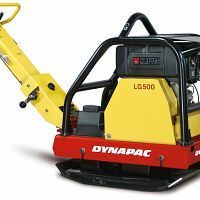 Our brand-new Dynapac LG500 offers a heavy-duty reversible plate with high compaction performance. A powerful 11 HP diesel engine makes the LG500 an economical alternative to heavy vibratory rollers. The wide base plate is designed for fast compaction of soil and stone material on large surfaces, and also for building foundations and backfill against supporting walls. This plate compactor moves at a rate of 78 feet per minute, weighs in around 1100 pounds, and features a plate size of 29.5” by 35.5”. Heavy-duty design. Weighs approximately 700 lbs. The Dynapac LG300 forward and reversible plate compactor is a heavy-duty plate for soil applications, ideally used for compaction of backfill in pipe and cable trenches, as well as road repair and maintenance work. Speed and compaction depth are regulated steplessly via hydraulic servo control – translation: this plate is smooth and very easy to operate. The design includes a strong cover that withstands severe shock and also protects all vital parts of the machine. Another great tool for compacting in tight areas, our Mikasa and MBW-brand Jumping Jack compactors weigh 135 lbs and feature a shoe size of 11” × 13”. Two models to choose from. Light-duty. Models weigh 130 lbs. These light-duty plate compactors have bases that are roughly 13” × 20”, and they weigh 130 lbs. These compact plate tampers are great for small jobs or tight areas, such as around retaining walls. We also carry rubber mats that bolt on to the bottom of our small plate compactors. Available for a small charge, these mats are ideal for tamping directly on top of paving stones. Designed to help protect the finish on pavingstones from scratches when vibrating joint sand into pavers. Our medium-duty gas plate compactors have a base of 19” × 22” and weigh a solid 200 lbs – this unit is our most popular plate compactor. A 10” × 10” steel plate affixed to the end of a 4’ wooden pole. Equally great for light-duty tamping and working on your biceps. Available with a variety of attachments. The Thunderbolt’s sliding handle provides force at the base of the unit without having to lift the entire tool, saving on labour. 19lbs; 5” × 5” plate.